How do I use the Courses page in an account? You can view courses in your account in the Courses page. You can view and filter courses by term and teacher and search for courses individually. You can also sort search result columns in ascending or descending order. If you have organized courses in your account by sub-accounts, click the Sub-Accounts link to locate and open the sub-account, then click the sub-account's Courses link. When you open an account, the account defaults to the Courses page. The Courses page displays all courses in the account. The page is designed with global settings at the top of the page  followed by the generated course data . Global settings include searching and filtering by course data. Filters and search fields are updated dynamically. Courses for all terms are displayed by default. 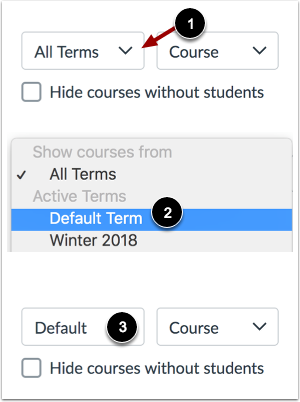 To filter courses by term, select the Terms menu . Terms are grouped by active, future, and past terms. The Default term is included in the active terms list. Depending on the number of terms in an account, the Terms menu may display a loading message until all terms are visible. When you select the Terms menu, the full name of a term is displayed in the list . Once selected, the term name is truncated in the menu . To view the full name of the term, click the Terms menu again. The Courses page defaults to searching by courses. To search for a specific course, type the name of the course in the search field . To search courses by teacher (instructor), click the Sort by menu  and select the Teacher option. The search field text will update to show courses are being searched by teacher. You can search by the instructor's name or user ID (SIS ID and login ID are not supported). If you want to hide courses with no student enrollments, click the Hide courses without students checkbox . If you only want to filter by blueprint courses, click the Show only blueprint courses checkbox . Blueprint Courses include the Blueprint icon . To add a course to the account, click the Add Course button. The Courses page paginates filter and search results in sets of 15 courses and are ordered by SIS ID. Each paginated page displays in a table format but columns are responsive according to the widest column for that page. Results display the name of the course , SIS ID (if applicable) , term , teacher , subaccount , and number of active students . Except for the Student column, each column heading can be sorted in ascending or descending order (alphabetically or numerically). Published courses display a check mark next to the course name . If a course includes more than two teachers, the Teacher column displays a Show More link . This link can be clicked to expand the full list of teachers. To open a course, click the name of the course . To view user details for a teacher in the course, click the name of the teacher . 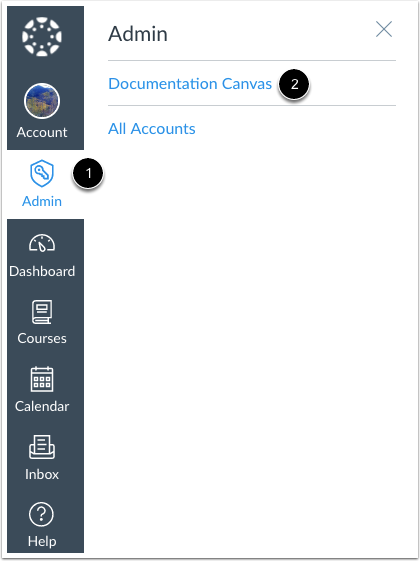 For quick access to course data, you can manually add a user to the course , view course statistics , and view course settings . Previous Topic:How do I obtain an API access token in the Canvas Data Portal? Next Topic:How do I add a course in an account as an admin? Table of Contents > Courses and Sections > How do I use the Courses page in an account?